World firsts require musicians of stature and within the 'tuba-sphere' Daniel Herskedal is forming a formidable reputation and now being part of the famed UK based Editions Records, his influence continues to grow. 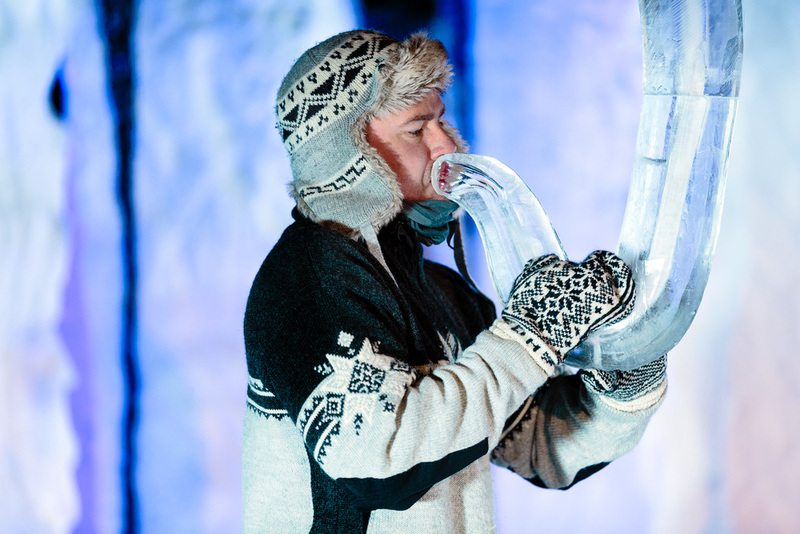 The world's only Ice Music Festival straddles the fine line of art and lunacy and the idea of a 7ft high step-through ice tuba certainly pushed that boundary to the limit. Taking 2 days to build with a team of 3 ice carvers and specific tuning input from Daniel himself, the Tubice took shape and was ready to assemble on the #icemusicfestival2016 stage in time for the opening concert of Day 2. Accompanied by leading Nordic drummers Snorre Bjerck and Helge Norbakken, along with Burkina Faso's leading balafon player - Mamadou Diabate, Daniel blew into the Tubice and the ground shook. The intensity of the huge structure's sound was amazing, coupled with a surprising range of pitch and frequency. The audience was transfixed. We've got a jammed packed 3 day of performances both in the main arena at 15:00 & 22:00 and then down at 'SlÃ¥ttahÃ¸len' by the lake shoreline next to Geilo Culture Church at midnight. For full details, please see our 2016 Performance Times page. Expect extraordinary musical exploration, as Gawain Hewitt and his bespoke 'under the ice' recording equipment will be performing with improv kings Arve Henriksen and Terje Isungset. Yes, you read that correctly -hydrophones and speakers deep in the water flowing under a ceiling of thick lake ice. This is also the second year the Art & Design School in Bergen (KHiB) have collaborated with us by designing and building the second concert arena. Born from artwork from KHiB, 14 students and teachers have created a sensational ice outpost at SlÃ¥ttahÃ¸len. Don't forget that we have loads of CDs and T-Shirts covering the entire history of our pioneering ice music - since the late 1990's. Geilo's Tourist / Information Centre is open through to late tonight and you browse the goodies there. We look forward to seeing you in Geilo - and don't forget to pack your warmest clothing...â�„ï¸� Follow us on Twitter @icemusicgeilo and like us on Facebook.